BuilduntuVM is a ready-made virtual machine, based on my guide here for preparing Ubuntu 16.04 to compile Android ROMs from source. It includes everything needed to sync with the repo of your choice (Cyanogenmod, AOKP, AOSP, etc) and start building. – Ready to compile Android N/O (6/7) ~ Now with JDK7! All you have to do is download the source code! 32 bit will not work! 1. Download and install the latest VirtualBox for your host system from here. 2. Download builduntuVM.zip and extract the OVA file to your hard drive. 3. Start VirtualBox, click File > Import Appliance. Select “Open Appliance” and navigate to the OVA, then click Next to import the virtual machine. 4. Highlight builduntu in VirtualBox Manager and open Settings. Under “System” you may want to give it more RAM and Processor Cores. The higher these values are, the faster ROMs will compile. 5. Start the machine, pull up a terminal and initialize a git repo. Once the source is finished downloading, it’s ready to go! via BitTorrent – PLEASE HELP SEED! For a ready-to-go Builduntu Install Disc (to dual boot etc.) check out the ISO here. Are there any features you would like to see? Did it work for your project? Respond below! Feel free to contribute to the new hardware fund if you appreciate my work. I want to test your VM. Can you give us a SHA-2 256 verification Code for the zip download? A Manifest is now included with the virtual machine image (as of 02-04-2014). This can be used to verify data integrity. Is there a package for vmware 5? I downloaded the link and was able to import it into virtualbox, but I prefer using vmware as my host. Thank you for all of your work on these build environments. I appreciate it because it is quite a pain to set them up. @Jerad Have you already tried to import the OVA package into VMWare? I’ve heard mixed results, but have not had a chance to try it myself. Users on another forum have never given me a definitive answer and I’d really appreciate finding out for sure. If it definitely doesn’t work, let me know and I’ll see what I can do about exporting it to a different format. @sylentprofet I have not tried the current version (v1.3) you have available in vmware 5. I am currently downloading the file and will report the results back when it is finished. I do have the release after Jan 16th (v1.1) and it did not work in vmware 5. It did work in virtualbox as described though. “The import failed because /Desktop/builduntu.v13/builduntu.v13.ovf did not pass OVF specification conformance or virtual hardware compliance checks. I clicked retry and it did import. At the first boot the mouse was a little screwy with me not being able to left click, but I restarted the machine and it seems fine now. I will give it a go for a while and see if any more errors arise. Thanks man, I appreciate the info and your support. I’ve been reading a couple of articles and the consensus seems to be that OVA and OVF files should import into VMWare. Not sure what the initial mouse hiccup is about exactly, I’ll look into it, but I’m glad you persisted and it ended up working. how to initialize the git? Check out my guide here starting at step number 11. The final 3 instructions are about initializing your android directory with a git repo (CM, AOKP, AOSP etc). it says “soupdawg.wordpress.com is no longer available. For future reference, my guide for 14.04 can be found here. Added a link to a torrent file. Thanks for helping out! Anyone that can seed is greatly appreciated. I’m working on the newest version of Builduntu as we speak, keep an eye out for the beta soon. I’ll be adding web seeds as per John’s request (thanks for the tip!) over at the Install Disc comments section. What if your actual SSD size is less than 250GB? I’ve tried re-sizing the vdmk and keep running into problems. The VM’s hard disk is allocated dynamically, so it only expands out as you need it. Stick to building one branch and for one device at a time, you’ll be fine. You are the greatest ever! I’ve been trying to compile cm-10 for my devices for two years now with no success until I used your preconfigured machine and now I have built 2 cm-10 roms for the Virgin Mobile Galaxy Victory 4G LTE all because of you. rock n roll and I can’t thank you enough for your hard work and for making my life easier. Thanks again. Oh, I just downloaded your new Builduntu and can’t wait to try it out. Yeah you right! You rock n roll dude. I just installed the new Pre-built Machine; I thought it was fairly easy before now this new machine basically sets itself up. I installed Virtual Box, your Machine and in 10 minutes I am already syncing the repo. I can’t thank you enough. Have an awesome evening. how can i connect my WD usb harddisk in builduntu 14.04 ? M greenhorn in linux. I appreciate ur help. You have to pass through the USB device to the VM. VirtualBox Guest Additions comes preinstalled, so before you start the builduntu machine, go into Settings and add the USB device. You may have to mount the device once you boot the VM, it may show up automagically on its own. If you don’t see it, try googling “mounting USB hard drive virtualbox VM”. What is the password for superuser su??? To do things as root, use “sudo”. The username and password are both android. The root account is disabled by default as a security precaution. I have tried various other build commands and all yield same error for me. I even did make clean and it still persists. I have tried breaking down the error and googling and to no avail. Any help would seriously…..be appreciated…. installs great – should we avoid using the software update. I ask because after using software update within xubuntu the size of the display shrinks and will no longer fill the screen. Using apt-get update and upgrade should be just fine. However, it is my personal recommendation to avoid using the dist-upgrade option. It is distinctly different in some important ways, and might break things. Thanks for the support everyone! I’ll be releasing a new version soon, stay tuned. Will this work for MTK6592 cell phones? Will this work with SP Flash tool? It should work for compiling Android for just about any device, phone, tablet, watch, etc. Also, any Linux tools designed to work with Ubuntu or Linux in general will work fine in Builduntu. Does it contain a GUI? And can I run apps on this(not GUI apps and not media apps)? I mean like Android kitchen? Yes, there is a GUI. I’m not sure what you mean by the second question, I’ve never used Android Kitchen. Like Android apps in an emulator? You need to configure git to identify who you are (during builds this info is stamped into the ROM information). git config --global user.email "you@example.com" && git config --global user.name "Your Name"
Then re-run repo init, it should finalize. I like to enable colored-terminal output personally, but default works fine too. At this point, you’ll execute “repo sync” and begin the lengthy process of downloading the code. Coffee/beer/cider/coconut water break time! All files are downloaded to the android folder, now what do I do? there is nothing obvious to where to begin. Do you have a guide on how to use this ROM making app after it’s installed? It depends on what flavor of Android you’re building, i.e. AOSP, AOKP, CyanogenMod, etc etc etc. After that, you will be presented with a list of available devices. Enter the corresponding number and the build process will begin. This process can take a long time, depending on your machine specs. Remember, whenever you make changes to your code locally or do a major repo sync you should also execute make clobber in your source directory. This will refresh the target directory for your new build. Thank you very much, for your great work! I wonna build CWM for my device from Cyanogenmod cm-11.0. Is it sufficient to only replace JDK7 with JDK6 in BuilduntuVM v1.5? Or do I have to change other files? After the two “update-alternatives” commands, you’ll be asked which version of Java to use as the system default. Simply choose JDK6 in place of JDK7. If you wish to build Lollipop ROMs, just run the same commands and switch back to 7. Make sure to do both java and javac! Which link are you using? Torrent or Mega? If you can give me some more information I’d be happy to help you out. I just downloaded the file from Mega and extracted it successfully. It must be something on your system. What zip program are you trying to use? What operating system? Walk me through your steps specifically. I have used 7zip and i also tried on my Lg G3 but no positive result .. It always appears a message that no files to extract ..
Google how to check the MD5 sum of a file and compare it with the original post. Your download may be corrupt. Also try the torrent. I know it’s not as fast but in order to help you troubleshoot the issue I think it’s the easiest next step. I downloaded the MEGA file and extracted it perfectly using my Linux system, and there have been no reports of anyone else experiencing this issue. If you download the torrent and it still will not work, then it is definitely something going on with your system. What OS are you using with 7zip? Windows 7? Md5 is not matched .. What shoud i do now? It appears that somewhere along the lines your download is being corrupted. Technically this should not be possible with the torrent. If you re-download the torrent and save it to the same location (C:\Downloads or where ever), it will check the contents of your existing file and verify it against the original. If any of the pieces are missing/broken, they will automatically be downloaded. It will not have to download the whole file again, only the corrupt pieces. My recommendation would also be to try using Windows built-in ability to extract zip files instead of 7zip. Also, try a different torrent client. My personal favorite is Deluge. You can change torrent programs and still try the above procedure very easily without needing to download the whole file again. If the problem continues to persist, it may be a deeper issue. Perhaps a bad RAM module or a hard disk starting to fail. You will have to do some troubleshooting. Good luck! No problem! I am glad you got it going. Let me know if you need anything else. I sent you an email with some instructions. Hopefully we will be able to fix it together. i’m having a problem. when i boot up the virtual machine it only shows a black screen. How long did you wait? It can take a while for BuilduntuVM to start up for the first time, especially on systems with limited resources. It might not look like there is anything going on, but just be patient. Give it a few minutes. If you still don’t have any luck, post some more information about your system. It’s hard to troubleshoot without details. Thanks for this. BTW It only makes a small difference, but you gain ~100MB savings by compressing with “xz -9e build…ova”. If you want it to go *much* faster and use all of your CPU cores, “7za a -txz -mx=9 builduntuvm.v15.ova.xz builduntuvm.v15.ova”. LZMA compression is available everywhere these days. Can you upload BuildUntu to another file hosting? Mega is actually down (http://www.isitdownrightnow.com/mega.co.nz.html) and the torrent is very slow. Added a Dropbox link. Apologies for the delay. I think Mega is back up also. Thanks for the heads up! Thanks for your awesome work on this! Where “##” is the number corresponding to your device, hammerhead. As for the username, go to the Menu in the upper left corner, and then Settings. Scroll to the bottom, you will see users and groups. From there, add a new user and create a password, then logout and log back in with the new username. Thanks for the support! Let me know if you have any other questions. Thanks. Another question. I’m trying to run virtual box on Windows 10 as the host. Once I import VM, and then close out of it, if I reboot my host I lose mouse and keyboard and network connection. Searched for windows 10 and virtual box to no avail. Any ideas what’s happening? I’ve tried it twice now. Can you create a docker container for this too? The amount of configuration and dependencies required on Linux tend to break other builds. It would be great to have a disposable container instead. Thanks in advance! Recently I’ve been learning Puppet, Vagrant, and Xen Hypervisor. I’ll take a look into building a Docker container as well. The release of 15.04 brought some interesting bugs into the config process, namely jayatana for Unity flavors. Thanks for the suggestion! Stay tuned. Thank you, you might consider looking into using lxc as docker is just a wrapper and is more targeted at single-app-per-container rather than lxc’s general lightweight VM goal. Just checked the Mega link and it appears to be working. Had to move the Dropbox link, should be working now. I’ll be releasing a new version soon. When I do, I’ll look into uploading it to a more reliable file host. Installed VirtualBox 5.0.1, imported the builduntuVM, It refused to load. It threw an error and this is what it said…. Any ideas? Id really love to give this VM a whirl as opposed to dragging another PCout ofthe garage to clutter my desk (Dual booting with Win10 and UEFI hasnt worked out for me yet). Also, it will not import to VMWare Workstation 11. Looks like they’re having some issues. Try downloading 5.0.2 and give that a shot. They should have it going soon enough. The virtual drive will expand as needed. So your 250 gb should be ok. Starting size is very small, building for one or two devices will take less than 100 gb total. Hi, may I enquire how’s progress on the docker container? Hi! Apologies for the delayed response. I have been quite busy with work. Another user named stucki posted this on github, it provides similar functionality to BuilduntuVM but in a Docker image. Failed to open virtual machine: Line 77: Unsupported element ‘StorageItem’. Line 95: Unsupported element ‘EthernetPortItem’. I’ve been working on a new version based on 15.10 – hopefully that might resolve some issues. What host OS are you using? Lots of people reporting problems with Windows 10 and virtualization. Is there a ready to go Builduntu 15.04 ISO for dual booting? Some things changed with the way images are packaged on the disc, so I may need to revise the technique for customizing. Keep an eye out for new versions soon! If you are referring to the terminal, use “sudo” – not “su”. Root is disabled for security reasons in Ubuntu. Otherwise, it definitely works. A bunch of people around the world have been using it without a problem for months. obviously this guide’s claim of “everything ready to go after install, just sync repo and go” are not accurate. I’m installing this on a freshly installed and completely updated laptop. It seems as though there are other things that windows needs before this guide is used. It would be a good idea to inform users of what windows needs in place before this guide is used. Also, if it were as simple as install, sync and build then i wouldn’t be getting errors, i installed VM then set the builduntu .img to run in VM, started the VM, started builduntu then went straight to entering the commands in this guide. Something must be missing or needs updating in this guide because following the instructions verbatim is not working. What are the “other things that Windows needs in place”? What version of Windows are you using? mingw32 is used for compiling VirtualBox in Windows, not sure why it would be needed for the binary install..
What repository are you trying to sync with? What device are you building for? What version of Android are you trying to compile? I need a lot more information to help fix the issue. No one else has reported experiencing this, so it wouldn’t be fair to blame the guide. If the host system is Windows 10, that might be the problem. Many users are reporting issues with Windows 10 and virtualization in general not working properly. If you are referring to the “guide” linked to in the first sentence (“based on my guide here”…), I think I see where the issue is coming from. This Virtual Machine is ready to go out of the box. That guide is for people setting up a brand new Ubuntu environment from scratch. You don’t need to do both. Once you load BuilduntuVM in VirtualBox, google for a guide on how to compile ROMs. All you should have to do is create a working directory (mkdir android), repo init, repo sync and then compile. Can we get the ubuntu software center in this? I’d rather use the GUI to install packages instead of terminal for convenience, seems unnecessary to do all that typing when their is a simpler way, plus, I don’t know all the linux commands and syntax. If i cant use the software center in this setup then i guess builduntu will have to be uninstalled. Can you test your build on your VM ? I will test emulator with win32 binaries. Was finally able to get a good hash from the torrent link. Failed to import appliance C:\Users\Paul\Documents\Vuze Downloads\builduntuVM.v16\builduntuVM.v16.ova. 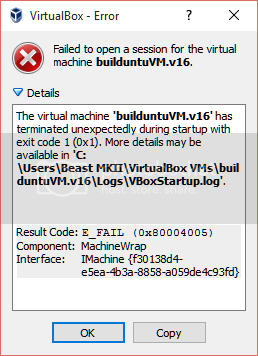 Could not create the imported medium ‘E:\Users\Paul\VirtualBox VMs\builduntuVM.v16\builduntuVM.v16-disk1.vmdk’. VMDK: Compressed image is corrupted ‘C:\Users\Paul\builduntuVM.v16-disk1.vmdk’ (VERR_ZIP_CORRUPTED). I have tried downloading from all three links. Mega and Dropbox give me CRC fails under 7zip. The torrent finally downloaded, and I get a good md2sum match. after extracting, it fails to import into VirtualBox, saying the vmdk is corrupted. If installinstalling on a virtualbox then this dowsnot matter right? My processer supports 64 bit but i use 32 bit os. It actually does matter. 32 bit host OS’s cannot host 64 bit virtual machines. You only need to have hardware virtualisation enable from BIOS. Do we need to take any additional steps to get networking in buildunt. My internet works good in host and ubuntu guest I have,but on booting this builduntu I get no connectivity notification. I double checked, as long as the processor supports 64 bit, the host OS can be 32 bit and still run a 64 bit guest. Thanks for the heads up! There should not be any additional steps required for networking in the VM. You can double check the image settings in VirtualBox Manager under the Network tab. Everything should work fine with NAT selected, unless you have a special network setup. Shall I make a installation video for this? Can you give us instructions on how to build a android rom from source on ubuntu 16.04. jdk 7 does not work and im so confused with all the old tutorial online for ubuntu 14.04. Any chance I could get access to an older version? I need to compile kit-kat (4.4.3) and the recommended OS for that is Ubuntu 14.04, so your v1.3 would be ideal for me. Thanks!! Google says it might have something to do with the wrong java version, but it’s on the correct one (jdk 7). I tried upgrading to the latest openjdk-7-jdk, but no difference. I just want to study android source code, but while I building the code “repo sync” from aosp, there are always some errors. So, why not provide a vmdk include android source code. The code can be build success, we don’t care if it is the latest code. Need more HDD space !! Please ! !